Congratulations to Barrie Newman on his Paul Simon Memorial Award. 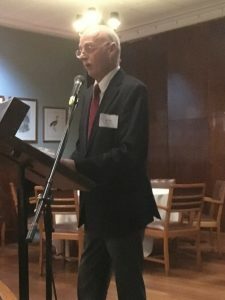 Barrie has a unique profile in Australian numismatics; he runs the Adelaide Mint (producing medals), is very active in the Numismatic Society of South Australia, and Barrie plays a key role in the publishing of the NAA journal. Barrie giving an impromptu acceptance speech at the NAAC2017 dinner (Kelvin Club, Melbourne).